The Ilfracombe House Guest AccommodationA family run hotel situated close to Southend seafront, town centre, HMRC Offices, Southend United Stadium and Westcliff Casino. It combines spacious and comfortable accommodation with a prime location close to Cliffs Pavilion and Adventure Island. Popular with artists from the Cliffs Pavilion Theatre, Ilfracombe House is also ideally situated adjacent to Southend seafront and the town centre. Guests can relax in the spacious and comfortable Chesterfield-style fireside lounge, study and luxury bar areas which are delicately lit throughout with crystal chandelier lighting. - All rooms have Flat TVs with about 80 digital channels including Sky Sports, free Wi-Fi broadband and mini fridge. - Full Dinner Menu. Fully licensed bar. Touch screen Windows 8 computer in the Hotel Lounge. - All rates include a full English cooked breakfast from the hot buffet breakfast counter available up to 11am daily. - Self-Catering apartments available for long and short term let. Visit our website for more information on our luxury Self-Catering Apartments. - Adventure Island wristbands available now for less than half price with any accommodation package. - All children under 1 year stay free of charge when using existing bedding. - One further child under 2 years is charged 5GBP per night in a baby cot. - Maximum capacity of baby cots in a room is 1. Consider upgrading to a Self-Catering Apartment with 2 double bedrooms instead of all in one bedroom for families with children. You may check in from 14:00 hours onwards. For any earlier or very late (after 11.00pm) check in times please arrange with the hotel. You must check out by 11:00 hours. Bookings must be cancelled BEFORE 2pm 1 day in advance of your arrival date. In the event of a no show or a cancellation with less than 1 day notice prior to the date of arrival, the total booking fee will be charged. FREE BREAKFAST - FREE WI-FI - FREE PARKING - SKY SPORTS - SAVE 10% BY BOOKING DIRECT WITH US. PROMO CODE IH10: https://www.thebookingbutton.co.uk/properties/ilfracombedirect Children welcome from any age. The Ilfracombe House sometimes limits bookings to 2 or more days. Compact Executive Ensuite with Double bed. Tastefully decorated en-suite SMALLER SIZE DOUBLE ROOM with double bed, 19 Sky/TV channels incl Sky Sports, DVD Player, Wi-Fi access & minifridge. Fully-Tiled ensuite Bathroom with shower. No. of Beds: 1 Double Bed, Prices are p/night, incl. b/fast & VAT. Compact Double sometimes limits bookings to 2 or more days. En-suite Family Room for families of 2 adults and 1 or 2 children. Nicely decorated and well equipped en-suite room with a Double and 1 or 2 Single beds, 19 Sky/TV channels including Sky Sports & DVD Player. Fully-tiled Bathroom with bath and Shower. Number of Beds: 1 double bed and 1 or 2 single beds. 5 Self-Catering Apartments available if more space is required, ring for more information. Family Room sometimes limits bookings to 2 or more days. 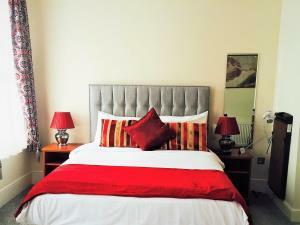 Luxuriously decorated and well equipped en suite double room. Sky channels including Sky Sports and DVD player. Unique Mediterranean style bathroom and furnishings, or a spacious bay-fronted aspect. Trouser press, iron and ironing board, desk fan, hairdryer, mini-fridge, direct-dial telephone with internet access point or Free Wi-Fi broadband. Fully tiled bathroom with bath and shower. Amenities: DVD Player, Fan, Trouser Press, Toilet, Ironing Facilities, Tea/Coffee Maker, Radio, Bath, Wake Up Service/Alarm Clock, Seating Area, Refrigerator, SKY TV, Telephone, Iron, Heating, Shower, Work Desk, TV, Hairdryer. No. of Beds: 1 Double Bed, Prices p/night, incl. b/fast & VAT. Luxury Double sometimes limits bookings to 2 or more days. Well equipped en suite double room with 19 Sky/TV channels including Sky Sports and dvd player, Iron and ironing board, fan, hairdryer, mini-fridge, direct-dial telephone with internet access point or Free Wireless Broadband. Fully tiled bathroom with bath and shower. Amenities: DVD Player, Fan, Toilet, Ironing Facilities, Tea/Coffee Maker, Radio, Bath, Wake Up Service/Alarm Clock, Seating Area, Refrigerator, SKY TV, Telephone, Iron, Heating, Shower, Work Desk, TV, Hairdryer. No. of Beds:1, Prices p/night, incl. b/fast & VAT. HOW TO GET TO ILFRACOMBE HOTEL? • Third on the right is Wilson Road, just before a mini roundabout. Our own car park can be found to the rear of the Ilfracombe Hotel in Alexandra Road. • To Southend Victoria (One Railway - Liverpool Street Line). 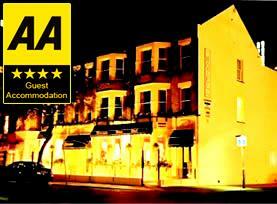 • Both stations are within walking distance of the hotel or only a few minutes by taxi. Call the hotel on 01702 351000 for more help. Very friendly staff, and great breakfast. Room was nice, quiet with a sea view, and although not the most modern, it was very clean & comfortable and in an excellent location.